Get our updates straight to your inbox. Sign up here. Just a week later over eighty people turned out on a Friday night to discuss climate change at our most recent event in Newcastle, attending by local MP, Nick Brown. This month we've also spent some time reflecting on ourselves as a team. 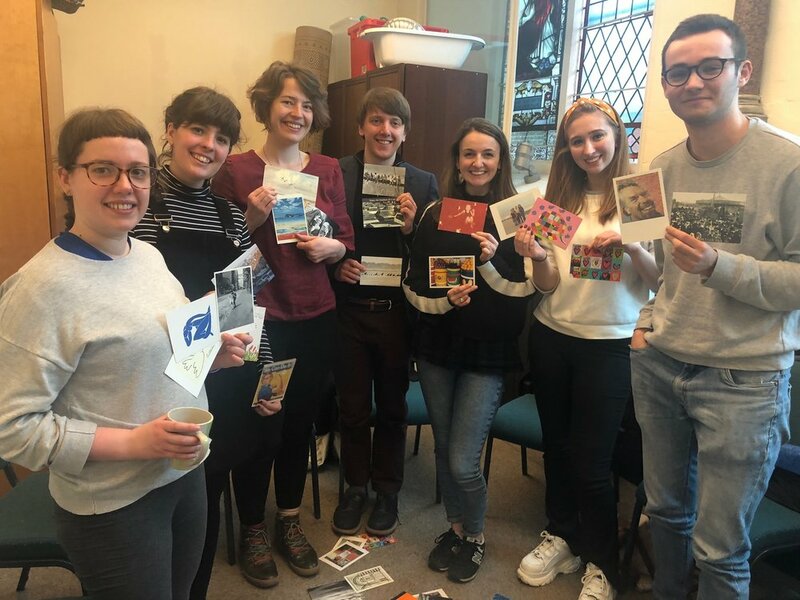 We've grown from a staff team of three to seven in the space of just over a year as our projects and work have expanded, so we took a day out to focus on how we can continue to support each other to do our very best to stop climate change. Read more below. We're also delighted to announce that we'll be at Greenbelt Festival this year, thanks to the generosity of one of our donors. If you're planning on being at Greenbelt please come and say hello, or you are also very welcome to get in touch to book a one to one session to discuss a tailored strategy for working with your MP. From left, Professor David Manning, Emma Bridge, Sarah Robinson, Nick Brown MP and Roger Middleton. The Robinsons, a family from Morpeth, felt hopeless about the prospect of making a difference in the climate change movement. The family followed the advice of youngest sister Sarah Robinson, our co-director, and decided to plan an event their own event. Sarah chaired this event alongside several other panellists. The success of this event can inspire us all, and show that one idea can be turned into something amazing and make a big difference . This month our team spent a whole day together, with the help of trustee Chris Lowry, learning more about ourselves and how we can work learn to work better together. The Hope for the future team has grown a lot since September, so it was lovely to sit down together and talk about our progress since then. We started by choosing pictures which best represented ourselves and what we value most, while this highlighted the differences in all of us it also demonstrated our shared value of hope. The Chris led us through our Myer Briggs personality test. In doing this exercise our team was able to connect and understand how each other works best and how to compliment their style. We left the day positive, revived and ready to tackle climate change. Our team is extremely thankful for all the support HFTF receives and this was an amazing opportunity to sit down and be thankful for one another as well. From left: Sarah Buck, Julia Cushion, Jo Musker-Sherwood, Logan Robin, Sarah Robinson, Georgia Robinson, Tom Wymer (see our ‘who are we’ page to learn more about the team here!). Having finished my internship, I've been focusing on training and public speaking events. In the last couple of weeks I’ve been lucky enough to travel to two different but equally fantastic events. Firstly, I went to Swindon for the CCL conference to deliver our Pathways to Effective MP Engagement training. With about 30 people in the room and 10 people joining in via Zoom, we had a really productive discussion about getting our MPs to take action, and I’ve had some lovely follow up emails. Then I went down to London last week to take part in a panel called The Social Injustice of Climate Change. We had some brilliant and challenging questions from the audience. I really enjoyed hearing about my fellow panellist, Dr Tara Quinn’s research about experiences of risk in relation to climate change. If you’re interested, take a look at this talk she gave a couple of years ago: https://www.youtube.com/watch?v=UebY43TIHek. Moving forward, today marks my first day in the role of Project Officer for our local councils project, so I’m looking forward to getting stuck in! This is a significant moment in the United Reformed Church, as three (out of 13) Synods have passed resolutions calling on the URC nationally to divest, which will now be debated at the URC's Mission Council in May. A big success toward the climate change moment. Read here. The Welsh Government have published 100 policies to tackle climate change. Many of these proposals already existed but some of the previously unannounced ones include ensuring that all public buildings are supplied with renewables by 2020, making all buses and taxis zero emissions by 2028, and putting more of a focus on sustainability in the school curriculum. Read here. Ford have announced that the Mustang muscle car will be becoming electric. They are hoping that the new electric Mustang will compete with Tesla’s Model Y. Some fans of the original car are concerned about the electric engine but Bill Ford, the Chairman of Ford, has promised them that the car will “go like hell”. Read here. Oslo will be installing wireless charging systems at taxi ranks, allowing electric vehicle recharging to be quicker and more efficient. This is part of Norway’s aim of making all taxis zero emissions by 2023 and all new cars by 2025. Read here. The stormy weather has been positive for the UK’s renewable energy generation. 35.6% of the UK’s electricity came from onshore and offshore wind between 8th and 14th March. This beat gas (31.2%) and nuclear (21.3%). Read here. Students across the world went on strike to protest against climate change earlier in the month. Here in the UK, 10 000 young people gathered in London and there were other protests across the country. The Education Secretary, Damian Hinds, criticised the protestors but Michael Gove, Claire Perry and several others released a video supporting them. Read here . Real Betis, a football team in Spain’s top division, have pledged to become carbon neutral. The club announced several plans to achieve this target, including an aim to power their 60 000 capacity stadium with renewable energy. The move follows League Two team Forest Green Rovers, who became the first football club to commit to becoming carbon neutral. Read here. Get our updates straight to your inbox!